Locust Projects is pleased to present Body Electric, a site-specific exhibition of new work by Thai-American artist Toby Barnes. Born in Miami, Body Electric will be Barnes’ first exhibition in the city. 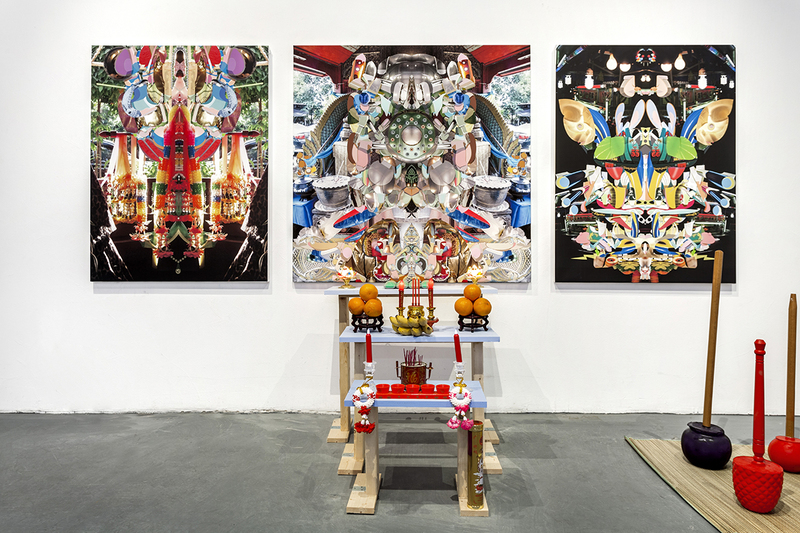 Building on his existing work that synthesizes Asian and Western iconography, and explores the sacred in the everyday, Barnes uses photography, painting and installation to transform the Project Room into a brightly-colored DIY home gym, including a soundtrack of an anonymous gym-goer working out. 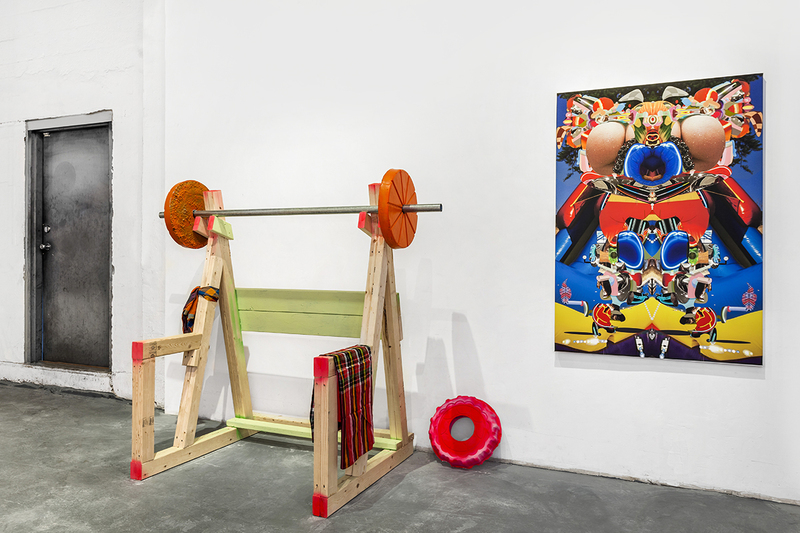 Making use of Locust Projects’ roll-up garage door as a nod to a common location for home gyms, the artist has created a number of weightlifting stations designed to exercise different muscle groups. Body Electric’s homemade weights, simply constructed from cement and pipes, reference Barnes’ experience as a teenager in North Miami, where he and his friends would fashion weights from everyday materials and found objects. 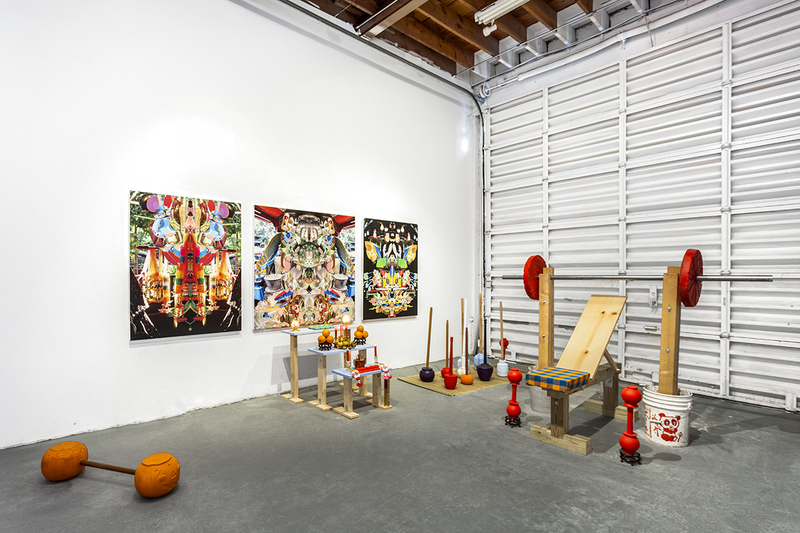 Each station will also be accompanied by a colorful large-scale painting, created by applying paint over a printed canvas featuring digital photographic imagery, so that each weight machine acts as both a piece of exercise equipment and a personal altar. The transformation of these rudimentary exercise machines into altars relates to the artist’s interest in the aesthetic of Asian altars, which are constructed by individuals as a focus for daily religious rituals within the home. The exhibition encourages us to consider contemporary culture’s fixation on the “body as a temple” and to explore the body as a site of worship and adoration, while also providing us with a site from which the body can be refined and remade.